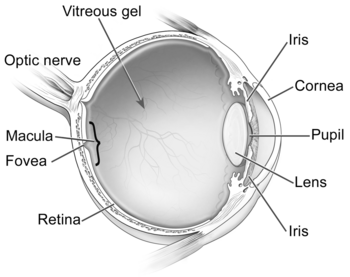 Although the cornea, which continues laterally with the layers of the sclera, appears to be one clear membrane, it is composed of several discrete layers. Conjunctiva—This is the thin, flexible layer of tissue covering both the inner surface of the eyelids and the sclera (the white of the eye). Its elasticity contributes to the ease of eye movements; its goblet cells contribute to the tear film by producing mucus; it heals rapidly with little formation of opaque scar tissue. Tear film—The liquid tear layer bathing the cornea and conjunctiva performs optical, protective, and lubricative functions. It creates a perfectly smooth liquid outer layer that polishes the corneal surface, mechanically traps and flushes out foreign bodies and chemicals, contains bacteriostatic substances that inhibit the growth of microorganisms, and reduces the surface friction associated with eyelid blinking and eye movement. Corneal epithelium—This is a renewable, transparent tissue that, along with the tear film, forms a refracting optical surface. It is the only corneal tissue that is innervated and can signal pain. Like all epithelia, it presents a barrier against the external environment, with intercellular junctions that prevent invasion by pathogens. The epithelium usually must be damaged before an infectious agent can become established. Corneal stroma—This layer of connective tissue, composed of extracellular matrix molecules and collagen fibrils, is responsible for the strength and shape of the cornea. Although other collagenous structures in the body are opaque (such as cartilage or skin), the corneal stroma is transparent. It is constructed from lamellar collagen fibrils that are small, uniform diameter, and equidistant. Some proteoglycans (PGs) and collagens are unique to the cornea, as is the total lack of blood vessels. Corneal endothelium—The main physiologic function of this thin inner layer is water transport. Corneal transparency hinges on the precisely controlled hydration required to maintain the stromal matrix structures in their correct spatial organization. The endothelium forms a barrier from the aqueous humor, based on the tight junctions and gap junctions between individual cells, and it maintains a fluid pumping mechanism controlled by a membrane-associated enzyme (Na+,K+-ATPase) that transports excess water out of the stroma. Without this pumping action, the stroma would develop edema, becoming swollen with water and cloudy. The human corneal endothelium has no regenerative and only limited repair capabilities. If endothelial cells are destroyed by disease or trauma, the remaining cells must enlarge and migrate to maintain function. When sufficient endothelial cell loss occurs, corneal edema and blindness ensue, with corneal transplantation as the only available therapy. ↑ 1.0 1.1 Report of the Corneal Diseases Panel by the National Eye Institute. This page was last modified on 7 September 2008, at 11:09.